This page compares GTO vs IGCT vs IGBT and mentions difference between GTO, IGCT and IGBT. 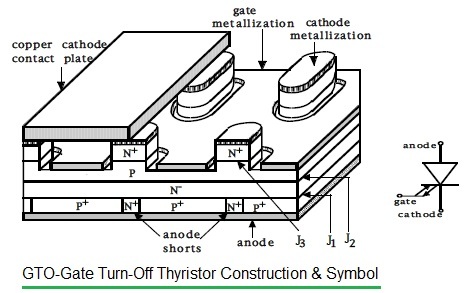 GTO stands for Gate Turn-Off Thyristor, IGCT stands for Insulated Gate Commutated Thyristor and IGBT stands for Insulated Gate Bipolar Transistor. The comparison between the three devices are derived with respect to symbol, characteristic, advantages, disadvantages and applications. The figure-1 above depicts GTO construction and circuit symbol. 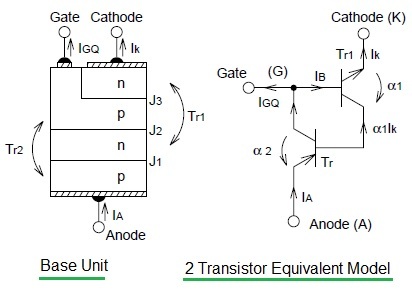 The figure-2 depicts GTO transistor base unit and its two transistor equivalent model. 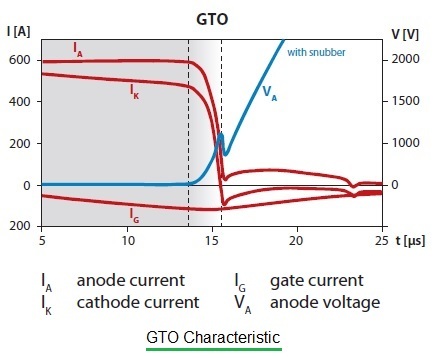 The figure-3 depicts voltage and current waveforms when GTO structure is turned off. 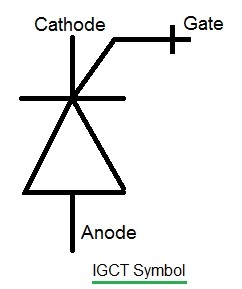 The figure-4 depicts IGCT circuit symbol. The figure-5 depicts IGCT structure. Figure-6 depicts voltage and current waveforms when IGCT structure is turned off. 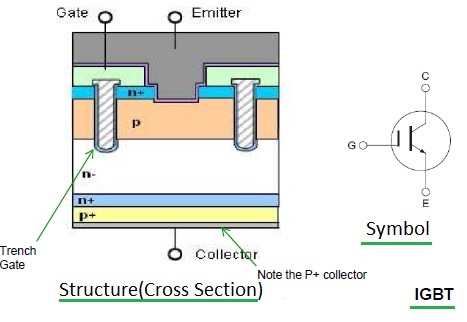 The full form of IGBT is Insulated Gate Bipolar Transistor. Figure-7 depicts 600 Volt G6H Trench IGBT structure and circuit symbol. Both the structures look same, but the main difference in IGBT p-substrate is added below the n-substrate. 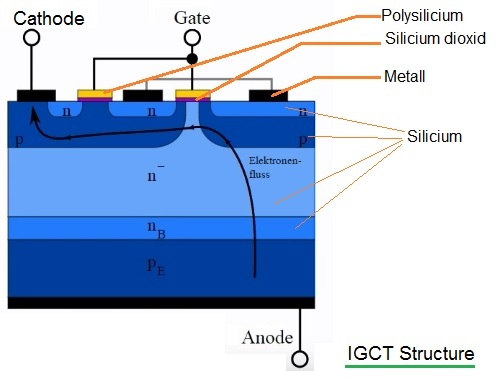 Figure-8 mentions output characteristics of IGBT. 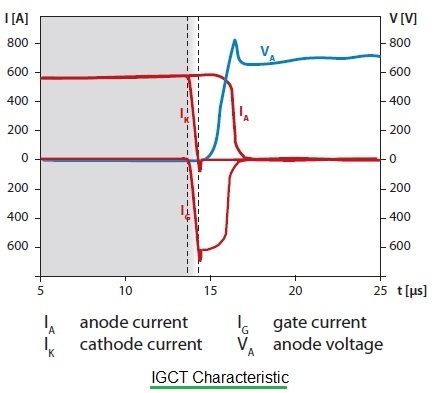 Refer MOSFET vs IGBT>> to understand more on IGBT device. Following table compares GTO vs IGCT vs IGBT and mentions difference between GTO, IGCT and IGBT. Advantages • Controlled turn-off ability. • Relatively high overload capacity. • Working frequency of hundreds of Hz. • Controlled turn-off ability. • Working frequency of kHz. • High cyclic resistance. • Controlled turn-off ability. • Minimum working frequency up to 10 kHz. • Very low control power. Disadvantages • Higher on-state losses. • High control power. • Very high on-state losses. • Relatively low cyclic resistance. ➨IGBT has high switching frequency compare to IGCT. ➨IGBT lifetime is ten times greater than IGCT. 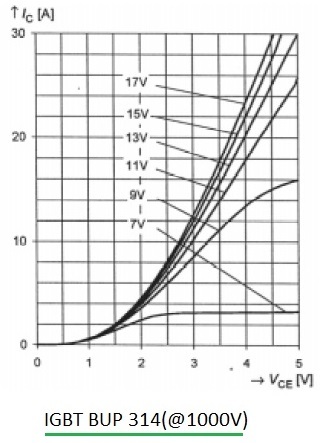 ➨IGCT has low ON state voltage drop. ➨IGCT are made like normal disk devices which has high electro-magnetic emission. They also have cooling problems.